Yankee’s pitcher Masahiro Tanaka flew into New York on Sunday with some major style by chartering a Boeing 787 Dreamliner from Japan Airlines for approximately $195,000 for the one way flight. 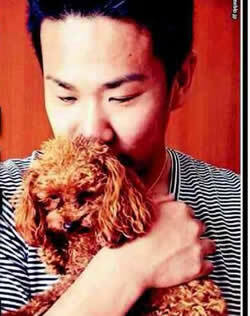 The Boeing 787 Dreamliner holds approximately 200 people but the only passengers aboard this flight were Tanaka, his wife Mai Satoda, their brown toy poodle Haru and three other people . Tanaka chartered the flight fearing weather complications and to beat the snowstorm that is currently impacting travel in the states. The flight from Tokyo to New York is approximately 5,870 nautical miles and is easily within the range of smaller private jets, so the question we’re asking is why did he decided to charter such a large extravagant plane? In our perfect world Tanaka’s need for such a large plane was to ensure that Haru arrived to his new home in the big apple as easily and comfortably as possible, but that is purely our speculation. Unlike all other dogs traveling Japan Airlines who must travel in the cargo department, Haru was able to pick his own seat out of the 195 open ones and freely move around the cabin. “Haru gave it his all on this long trip” Satoda said “I think he’s rather tired…But I’m relieved that he’s eating and toileting OK.” We say chartering a nearly $200,000 flight is okay for the love of your canine, but on the contrary the fact that the aircraft refueled and flew back to Japan empty is not very environmentally friendly and should be something Tanaka should take into consideration next time around.